Hanging is the suspension of a person by a noose or ligature around the neck. The Oxford English Dictionary states that hanging in this sense is "specifically to put to death by suspension by the neck", though it formerly also referred to crucifixion and death by impalement in which the body would remain "hanging". 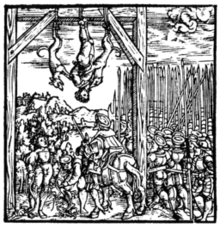 Hanging has been a common method of capital punishment since medieval times, and is the primary execution method in numerous countries and regions. The first known account of execution by hanging was in Homer's Odyssey (Book XXII). In this specialised meaning of the common word hang, the past and past participle is hanged  instead of hung. This process, also known as the measured drop, was introduced to Britain in 1872 by William Marwood as a scientific advance on the standard drop. 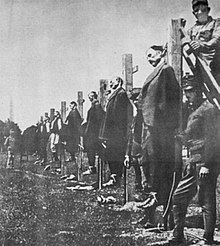 Instead of everyone falling the same standard distance, the person's height and weight  were used to determine how much slack would be provided in the rope so that the distance dropped would be enough to ensure that the neck was broken, but not so much that the person was decapitated. 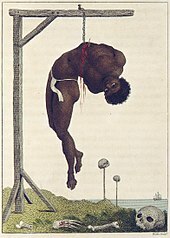 The careful placement of the eye or knot of the noose (so that the head was jerked back as the rope tightened) contributed to breaking the neck. The cause of death in hanging depends on the conditions related to the event. When the body is released from a relatively high position, the major cause of death is severe trauma to the upper cervical spine. 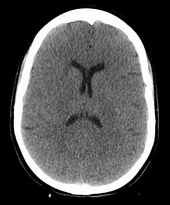 The injuries produced are highly variable. One study showed that only a small minority of a series of judicial hangings produced fractures to the cervical spine (6 out of 34 cases studied), with half of these fractures (3 out of 34) being the classic " hangman's fracture" (bilateral fractures of the pars interarticularis of the C2 vertebra). The location of the knot of the hanging rope is a major factor in determining the mechanics of cervical spine injury, with a submental knot (hangman's knot under the chin) being the only location capable of producing the sudden, straightforward hyperextension injury that causes the classic "hangman's fracture". According to Historical and biomechanical aspects of hangman's fracture, the phrase in the usual execution order, "hanged by the neck until dead," was necessary. By the late 19th century that methodical study enabled authorities to routinely employ hanging in ways that would predictably kill the victim quickly. The side, or subaural knot, has been shown to produce other, more complex injuries, with one thoroughly studied case producing only ligamentous injuries to the cervical spine and bilateral vertebral artery disruptions, but no major vertebral fractures or crush injuries to the spinal cord. Death from a "hangman's fracture" occurs mainly when the applied force is severe enough to also cause a severe subluxation of the C2 and C3 vertebra that crushes the spinal cord and/or disrupts the vertebral arteries. Hangman's fractures from other hyperextension injuries (the most common being unrestrained motor vehicle accidents and falls or diving injuries where the face or chin suddenly strike an immovable object) are frequently survivable if the applied force does not cause a severe subluxation of C2 on C3. La Pendaison (The Hanging), a plate from French artist Jacques Callot's 1633 series The Great Miseries of War. On 26 October 2010, Saddam's top minister Tariq Aziz was sentenced to hang for persecuting the members of rival Shi'a political parties. His sentence was commuted to indefinite imprisonment after Iraqi president Jalal Talabani did not sign his execution order and he died in prison in 2015. Although Israel has provisions in its criminal law to use the death penalty for extraordinary crimes, it has only been used twice. On 31 May 1962, Nazi leader Adolf Eichmann was executed by hanging. Meir Tobianski was summarily executed for espionage during the Israeli War of Independence, but he was later exonerated. On 27 February 2004, the mastermind of the Sarin gas attack on the Tokyo subway, Shoko Asahara, was found guilty and sentenced to death by hanging. On 25 December 2006, serial killer Hiroaki Hidaka and three others were hanged in Japan. Long drop hanging is the common method of execution in capital punishment cases in Japan, as in the cases of Norio Nagayama,  Mamoru Takuma,  and Tsutomu Miyazaki. In 2018 Shoko Asahara and several of his cult members were hanged for committing the 1995 sarin gas attack. Death by hanging is the traditional method of capital punishment in Jordan. In 1993, Jordan hanged two Jordanians convicted of spying for Israel. Sajida al-Rishawi, "The 4th bomber" of the 2005 Amman bombings, was executed by hanging alongside Ziad al-Karbouly on 4 February 2015 in retribution for the immolation of Jordanian Pilot Muath Al-Kasasbeh. 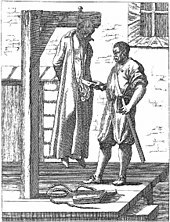 As a form of judicial execution in England, hanging is thought to date from the Anglo-Saxon period. Records of the names of British hangmen begin with Thomas de Warblynton in the 1360s;[ citation needed] complete records extend from the 16th century to the last hangmen, Robert Leslie Stewart and Harry Allen, who conducted the last British executions in 1964. 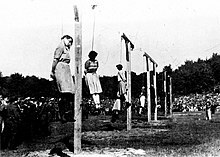 Three British subjects were hanged after World War II after having been convicted of having helped Nazi Germany in its war against Britain. John Amery, the son of prominent British politician Leo Amery, became an expatriate in the 1930s, moving to France. He became involved in pre-war fascist politics, remained in what became Vichy France following France's defeat by Germany in 1940 and eventually went to Germany and later the German puppet state in Italy headed by Benito Mussolini. Captured by Italian partisans at the end of the war and handed over to British authorities, Amery was accused of having made propaganda broadcasts for the Nazis and of having attempted to recruit British prisoners of war for a Waffen SS regiment later known as the British Free Corps. Amery pleaded guilty to treason charges on 28 November 1945  and was hanged at Wandsworth Prison on 19 December 1945. William Joyce, an American-born Irishman who had lived in Britain and possessed a British passport, had been involved in pre-war fascist politics in the UK, fled to Nazi Germany just before the war began to avoid arrest by British authorities and became a naturalised German citizen. He made propaganda broadcasts for the Nazis, becoming infamous under the nickname Lord Haw Haw. Captured by British forces in May 1945, he was tried for treason later that year. Although Joyce's defence argued that he was by birth American and thus not subject to being tried for treason, the prosecution successfully argued that Joyce's pre-war British passport meant that he was a subject of the British Crown and he was convicted. After his appeals failed, he was hanged at Wandsworth Prison on 3 January 1946. Theodore Schurch, a British soldier captured by the Nazis who then began working for the Italian and German intelligence services by acting as a spy and informer who would be placed among other British prisoners, was arrested in Rome in March 1945 and tried under the Treachery Act 1940. After his conviction, he was hanged at HM Prison Pentonville on 4 January 1946. Hereditary peers who committed capital offences,  as anticipated by the fictional Duke of Denver, brother of Lord Peter Wimsey. The Duke was accused of murder in the novel Clouds of Witness, and if convicted, this execution would have been his fate, after conviction by his peers in a trial in the House of Lords. It has been claimed that the execution of Earl Ferrers in 1760 – the only time a peer was hanged after trial by the House of Lords – was carried out with the normal hempen rope instead of a silk one. The writ of execution does not specify a silk rope be used,  and The Newgate Calendar makes no mention of the use of such an item  – an unusual omission given its highly sensationalist nature. An image of suspected witches being hanged in England, published in 1655. Balvenie Pillar, also known as Tom na Croiche (Hangman's Knoll). The pillar was erected in 1755 to commemorate the last public hanging in the Atholl region of Scotland in 1630. Hanging noose used at public executions outside Lancaster Castle, c. 1820–1830. The largest mass execution in the United States, of 38 Sioux Indians sentenced to death for engaging in massacres of American settlers, was carried out by hanging in Mankato, Minnesota in 1862. A total of 40 suspected Unionists were hanged in Gainesville, Texas in October 1862. 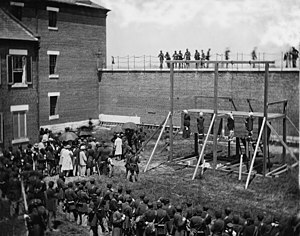 On 7 July 1865, four people involved in the assassination of President Abraham Lincoln— Mary Surratt, Lewis Powell, David Herold, and George Atzerodt—were hanged at Fort McNair in Washington, D.C. Various methods of capital punishment have been replaced by lethal injection in most states and the federal government. Many states that offered hanging as an option have since eliminated the method. Condemned murderer Victor Feguer became the last inmate to be executed by hanging in the state of Iowa on 15 March 1963. 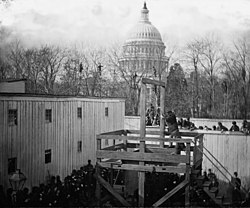 Hanging was the preferred method of execution for capital murder cases in Iowa until 1965, when the death penalty was abolished and replaced with life imprisonment without parole. Barton Kay Kirkham was the last person to be hanged in Utah, preferring it over execution by firing squad. No subsequent inmate in Utah had been hanged by the time the option was replaced with lethal injection in 1980. [ citation needed] Laws in Delaware were changed in 1986 to specify lethal injection, except for those convicted before 1986 (who were still allowed to choose hanging). If a choice was not made, or the convict refused to choose injection, then hanging would become the default method. This was the case in the 1996 execution of Billy Bailey, the most recent hanging in American history; since then, no Delaware prisoner has fitted this category, and thus the state's gallows were dismantled. The proper, traditional past tense and past participle form of the verb "hang", in this sense, is (to be) "hanged". Some dictionaries list only "hung",   whereas others show both forms. For example, "people are hanged; meat is hung". ^ Sauvageau, Anny; Racette, Stéphanie (2007). "Sauvageau, Anny; Racette, Stéphanie (2007). "Agonal Sequences in a Filmed Suicidal Hanging: Analysis of Respiratory and Movement Responses to Asphyxia by Hanging". Journal of Forensic Sciences. 52 (4): 957–9". Journal of Forensic Sciences. 52 (4): 957–959. doi: 10.1111/j.1556-4029.2007.00459.x. PMID 17524058. ^ Hellier, C.; Connolly, R. (2009). "Cause of death in judicial hanging: a review and case study". Medicine, Science, and the Law. 49 (1): 18–26. doi: 10.1258/rsmmsl.49.1.18. PMID 19306616. ^ " Modern-day 'outlaws' gather to honour Jánošík". The Slovak Spectator. 9 July 2012. 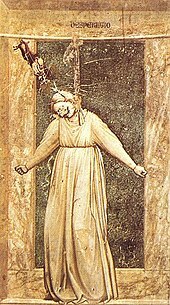 Wikimedia Commons has media related to Death by hanging.